Alice was the pretty face behind the window at the Chicken Shack on Williams and 23rd. She went to work as usual that day, she just never came home. “Small green feller, eyes like a Lizard – plumb dragged her into his spaceship,” said Hairy Bob. 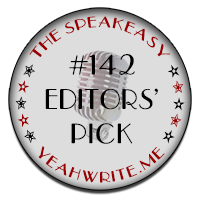 Hairy’s liking for cheap liquor made him a great one for stories. Alice’s boy, Tommy, now lives with his grandma. He doesn’t understand that his mother has gone, and probably never will. There’s rumour of a woman the spit of Alice being seen over in Harbourdale with another man, and other children. Round here folks prefer to think that, just maybe, Hairy was telling the truth after all. This entry was posted in Fantasy World, Friday Fictioneers, Hairy Bob, Story Time and tagged 100 Words, Abandoned, Challenge, Coping, Creative, Fantasy World, Fiction, Flash Fiction, Friday Fictioneers, Mentally Disabled Child, New Life, Novels, Runaway Mother, Short Stories, WordPress on August 12, 2015 by paulmclem.